This is a big year for me. It is the year of my 40th high school reunion. It is hard to believe but it is really here and I plan to attend. So when I was contacted by Flex Belt to receive one of their belts to test out I thought the timing was great. What could it hurt? And with luck, it might just help! Can it be effectively used by those of us who are overweight? One concern I had that I communicated up front is that I am not a skinny woman. I may have lost almost 60 pounds but I am not a small woman. They have accommodated for this with an extension piece to attach to the belt. Honestly, I wondered how the belt would do on a person like me who is big, with a layer of fat around my middle. Would the toning system be strong enough to make a difference? It seemed like a good question I could personally research and experience to share with others. How might it affect those with IBS? Another area of concern I had was whether the stimulation of the belt might trigger my IBS. The first couple of times I used the belt I did have uncomfortable twinges after finishing the session. I wondered if it would escalate into an “episode” but it never did. This is meant to be a caution alert for those who may have severe cases of IBS; talk to your doctor first. But it was a relief for me that I could use the belt without negative consequences. How easy is it to use? When I received the Flex Belt I was impressed with its packaging. It is attractive and the information provided is clear. There is a little assembly required to attach the control unit and the gel pads to the belt but nothing is difficult to do. Once I assembled the necessary pieces I then tried on the belt. The gel pads make it cool to put on. And the belt is stretchy enough I didn’t end up needing to add the belt extension. Next I had to figure out the settings. There are many. There are a number of different programs you can choose from. They recommend you start with #1. Then you can adjust the amount of time the belt is on. That starts at 20 minutes. Then you can adjust the intensity. It can range from 1 to 150. They recommend you get up to 15 during your first session. Then they recommend you use the belt at least three times a week or up to five times, if you can manage it. All of this was very manageable. It was actually fun to play with the different levels of intensity. They provide a booklet with the Flex Belt. You can record the days you use the belt and the programs and intensity you choose. This made it very easy to keep track of what I was doing. What kind of results do you see? I was great at using the belt 3 to 4 times each week for the first 3 weeks. Then I started traveling and my consistency of use faded. While I used it I did feel a difference. I measured my waist at the beginning and after two weeks my waist had shrunk by ½ inch. Regrettably, after the hiatus my waist went back to its former circumference. But I did see it made a difference and with longer-term use I suspect I would have more impressive results. What has remained is the improved muscle tone. I do sit ups and can now do more with ease. So what do I really think? I liked the quality of the product. I saw results. The results were such that it has motivated me to want to use it for longer and more intensely to see how far I can go to maximize overall results. As a product by itself it is not a panacea but as part of an overall healthy lifestyle plan it is a good addition. It is pretty effortless but plays an important role in reminding us about the steps we need to take to live a healthy life. Anyway we can keep reminding ourselves throughout the day how to live vibrant and be healthy is a good thing. And you do also get results! 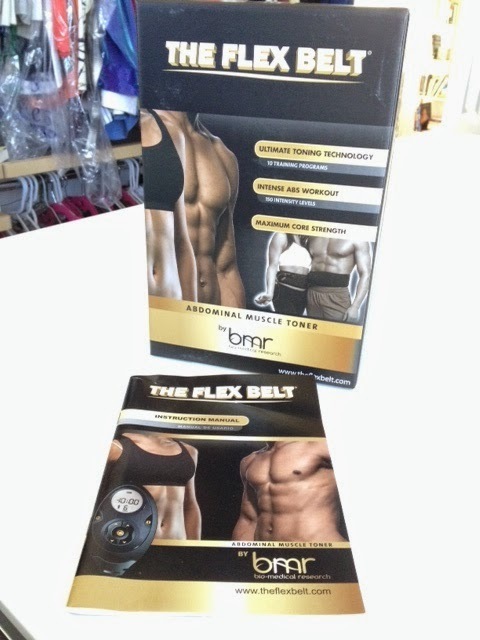 The Flex Belt is one more tool for our Healthy Lifestyle Tool Chest by helping us stay focused on the ultimate goal to be healthy and live life to its fullest.